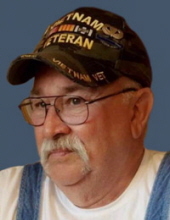 ALEXANDRIA, IN- Robert L. “Butch” Lewis, 71, passed away unexpectedly early Sunday morning, April 7, 2019 at Community Hospital in Anderson. His death was a result of the effects of being exposed to Agent Orange. He was born on June 13, 1947 in Elwood to Bob and Pauline (McRoberts) Lewis and has lived in Alexandria for most of his lifetime. Butch was a graduate of Alexandria-Monroe High school-Class of 1965. He served in the United States Army Rangers in Viet Nam, D Company 151 Inf. Division. He later served with the Indiana National Guard for 13 years. He was all about God and his Country and facilitated the annual veteran’s Christmas Party at the Marion Veteran Administration Hospital for more than 20 years. He was a member of the AmVets, Michigan Post MI-0120. Butch retired from Delco-Remy in 1999 after 33 years of employment. He was the founder of the Alexandria Little League program approximately in 1973. He enjoyed hunting, fishing and time spent with family and friends. Butch was a member of the former Morningside First Baptist Church of Muncie. He was currently a member of the Summitville First Baptist Church where he had served as a deacon. He had been a member and Past President of the Alexandria Kiwanis Club for more than 30 years, and was always involved with the 4-H Fair every year. Services honoring Butch’s life and legacy will take place at 11:30 am on Thursday, April 11, 2019 in the Owens Funeral Home, 412 North Harrison Street, Alexandria with Rev. Alex Beane officiating. Interment with military honors in the Veteran’s Administration Cemetery in Marion. Friends may call at the Owens Funeral Home in Alexandria from 4 pm to 8 pm on Wednesday or on Thursday after 10 am prior to the services. Memorial contributions are suggested to the American Diabetes association, the Parkinson’s Foundation or the Indiana National Guard Relief Fund. Butch continued his unselfish life style by being a tissue donor after he passed away. Owens Funeral Home is honored to care for Butch and serve the Lewis family. To send flowers or a remembrance gift to the family of Robert L. "Butch" Lewis, please visit our Tribute Store. "Email Address" would like to share the life celebration of Robert L. "Butch" Lewis. Click on the "link" to go to share a favorite memory or leave a condolence message for the family.